Omar and Julio are working on the retaining walls. We want to get those up before rainy season comes. The corner of the tennis court is not so stable right now. Lisa and I got back from the junior-senior camp yesterday. It went very well, but I aggravated a back problem that I've had for the last three weeks. I think lack of exercise (other than walking up and down the hill) in January and then after my thyroid operation has weakened my back. (I also have been gaining weight, mostly because I still don't have the proper amount of synthetic thyroid.) So, I currently cannot walk, and am preparing for classes tomorrow lying on my back in the living room with my laptop on my stomach. The doctor prescribed two pain-killers/anti-inflammatories along with ibuprofen. I'm hoping to be able to teach tomorrow, but we'll see. Thanks for your interest in the walkway project, and I'd appreciate your prayers. Greetings from warm and windy Costa Rica. Omar and Julio mounted the Ron's plaque yesterday so Lisa, Natalia and I went down to take pictures of it this morning. I took a few pictures through the windows of the K-P classrooms as well. The fourth room is being used by the K-P English teacher who also gives class to the 1st and 2nd graders in the room. I'm pretty sure that we'll be using that room as the second preschool room for next year. With this upgrade to the facilities, we will attract even more parents. An unexpected, exciting, "God-thing" happened this last week. We hosted a group of engineers and architects that volunteered to design a new building for a church near San Jose. For some reason, the church they were going to backed out of the arrangement at the last minute. 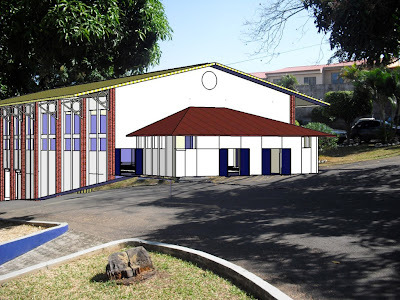 I had been in contact with the ministry (Engineering Ministries International, http://emiworld.org/), about six months ago about a concept design for the LPDV auditorium, so they called to ask if we still needed it! Attached are a few of the concept design pictures of the auditorium that would sit where the old K-P building is. I know, I know, you are all asking "but where would we sleep?!" We'd figure something out. The team also did a very complete design for the covered walkway to the gate and the turn-around. I'll send some scans of that too, once they give me the finished product. So, it could be that God is moving the auditorium project forward must faster than I thought. I have no idea, so far, how much the building will cost. I'm going to contact former LPDV students who are currently studying architecture/engineering to see if they want to take that estimation on as part of a class project. Greetings from sunny and HOT Costa Rica! Hope you guys are all doing well. Attached is a zipped folder with 29 pictures from the first day of school. Actually, the first OFFICIAL day of school is Monday, but the K-P building was used by LPDV students for the first time on Thursday. Directors, teachers, parents, and STUDENTS are delighted. Staff orientation went well. Looks like we have a great team of teachers for this new school year. Please continue to pray that they will be used by God for His purposes in the lives of our students and their families. In case you haven't head, both of my thyroid tumors were benign. Praise God for that! I have some rather graphic surgery pictures of what I was walking around with in my throat. If you are interested, I can send them on to you. HARRY: would you please send this email to the whole MIM team and send me a copy too. I gave away the team book with everyone's emails, and I'd like to get them all. Thank you all for the hard work, AND the large amount of work funds! 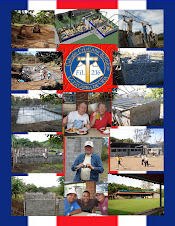 Thanks for making LPDV a sharper tool in God's tool box in Costa Rica! Thanks so much for your concern for Matt and our family. Matt went into surgery around 7:00 last night, and they finished up at 11:30. The main tumor was quite a bit larger than what had shown up on the original ultrasound. The surgeon described the tumor as “hugging” one of the nerves that control the vocal chords, and spent an hour and a half dissecting that part of the tumor to spare the nerve. The four parathyroids appear to have been left intact and functioning normally. Matt was back in his room by 12:30, and settled in by 1:00 a.m. He walked a little bit at 3:00 a.m., and has shown a lot of improvement since then. The anesthesiologist took pictures on our camera during surgery, for anyone who is interested. We promise not to include them in a general email. Again, we are grateful for all of the concern and prayers extended on our behalf. We are thankful that it appears things have gone so well. We should have biopsy results by next Monday. Although we’d hoped to go home this evening, the surgeon just stopped by to say that Matt needs to stay another night to have potential bleeding monitored. We’d appreciate your continued prayers for Matt’s full recovery. Well we were delayed leaving San Jose,CR by over 1 hour, then in Atlanta they didn't have a gate for us right away. By the time we got through customs the plane left. Spent the night and most of us were on the 12:15pm flight. Three had the 11am flight. A lot of work was accomplished at LPDV school. Time of devotions in the morning and evening is always a plus on this trip. If there was no worshiping with singing songs, reading and studying God's word and having fellowship with Christian believers I probably would not go on this trip. So I thank God for putting this Team together and for all of able to serve in Costa Rica to further the gospel of Christ in this part of the World. School starts on February the 8th and I prayer for the teacher to be a Christ like example to the students and that these students can become the future leaders in Costa Rica and the World to spread the gospel. Lisa will probably send out an email about how Matt is doing and the results of he operation that was to take place at 6pm today. I will update the Blog when I find out. Lisa, Josh and the 13 students arrived safely late Saturday night. 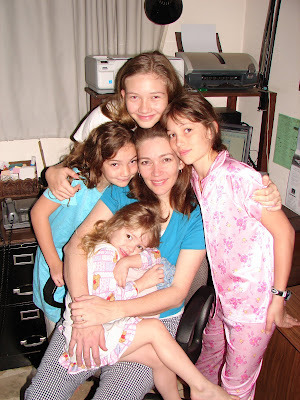 The girls and Matt were excited to have Lisa back home. The team will be leaving LPDV around 11:30 for our 2pm flight. If all goes well we should land at O'Hare around 11:45. Praying for a safe and uneventful flight home.